We think the best bread maker you can buy is the Panasonic SD-ZB2512. It's reliable, advanced, and incredibly simple to use. We love it, but it might not be right for you, so we've collected, reviewed and ranked seven other excellent bread makers. Obviously, the most important thing to look out for when buying a bread maker is how well the machine can actually bake bread. Luckily, we've done that part of testing for you, and ranked the machines on how reliably it pump out quality loafs. You'll also need to decide what type of machine you want - most on this list are pretty simple to operate, just add the ingredients, press a few buttons and let the machine do all the work for you. Some, like the Sage, are a little more complex, and aimed at bakers with Paul Hollywood level skills. Bread makers have health benefits as well, don't ya know: a number of our selections here have gluten-free modes. And weirdly, you can usually use them to make jam, giving you an entire breakfast from one device. What's not to like? With fresh, healthy loaves on demand and the waft of a boulangerie in the T3 test room, we tried out eight of the best baking 'bots to discovered the ultimate all-in-one miniature bakery. Fancy a coffee with that?… Or what about some freshly squeezed juice? Now how about toasting that bread? With some, er, boiling hot water? Yummy. If there's one brand that's pushing the ancient science of machine bread making forward, it's Panasonic. This latest model comes with more features than ever, including a two-stage, 'rustic sourdough' function. We tried our hand at this most artisan of bread-types and some of the other 33 programs on offer. It's an unusually tall machine because built into the hinged lid are not one, but two dispensing compartments, one for nuts and seeds and another for yeast. The latter innovation ensures the active ingredient is timed for maximum effect. That means there's no room for a window, through which to peer at your dough, but it seems a sacrifice worth making for the increased reliability. This continuity also owes something to the sensors that monitor the temperature both inside and outside of the machine. In a cold kitchen, the initial rising stage is extended to get your ingredients up to speed before the baking stage begins and ensure it finishes bang on time with the same results as in a hot kitchen. The other unique feature is the rustic sourdough cycle. That's the especially tasty artisan loaf that requires a fermented dough starter to rise. With the SD-ZB2512, you get two plastic containers in which to mix your yogurt and yeast starters and a setting that heats them (without stirring) in the tubes before storing in a fridge overnight ready for baking the following day. With no kitchen skills whatsoever, we managed to turn out a plump and satisfying sourdough.It feels like real baking, albeit with a machine to take care of the boring bit. This handsome bread maker feels exceptionally well made with its metal and glass construction and detachable lid. There's a window to check your bread's progress and an automatic dispenser to dump nuts, seeds or dried fruit into the mix at the appropriate time. Gluten-free bread is notoriously tricky to bake, but our first effort was a complete success using the Kenwood's GF-mode. There are 20 modes to choose from in all, including cakes, pizza dough and jam. As is often the case with bread makers, the detachable paddle nearly always ends up stuck in your loaf, leaving a hole when you fish it out, unless you remember to remove it after the kneading stage. In all other respects, this is a brilliant bread maker that we've noticed is often generously discounted. Cuisinart's brushed steel bread maker looks like a premium machine and it includes refinements such as a nut dispenser, and convection air circulation for better baking. The 12 preset programmes include a gluten-free mode and there's a 13-hour delay function for scheduling a timely bake. The CBK-250 doesn't come with any accessories, but you do get an excellent recipe book, from which we made a very presentable gluten-free cake and a decent loaf. Being impatient, we baked the bread on 'ultra-fast mode' in one hour 24 minutes and still managed a satisfying result. The only downside here is the noise of the fan. Even in 'keep warm' mode, it was the noisiest machine in our test. It looks like absolute arse, but this inexpensive blob of plastic turns out perfectly acceptable loaves of regular and gluten-free bread, and made us a perfect cake too. It's a compact, no-frills thing without a nut dispenser or bundled accessories, but the pan is the same volume as the other machines, which just means your loaf rises right up to the especially large viewing peephole. There are only 12 preset modes, but they include a gluten-free cycle, which worked very well for us, and a record-breaking 55-minute rapid bake mode, which was perhaps a bit rushed, giving doughy results. The manual is a mere pamphlet, but it's surprisingly well written and full of tips and great recipes. Sure, it's ugly, but this Russell Hobbs is the only bread maker that actually fits in a cupboard and we have no hesitation in recommending it as a budget best buy. Many bread makers just have the function to create regular loaves; this baby goes the extra step though, letting you shape your dough into mini baguettes. Presets let you easily whip up breads, cakes and dough and this can all be done on a timer – so you just set it off at night and you'll wake up to that lovely aroma of baked bread in the morning. Another frankly ingenious addition is the removable scale, which easily slides into the top of the machine and means it'll always be on hand when you need to weigh out the ingredients. A solid, premium bread maker, and not a bad looker as such devices go. As usual, this Heston-approved bread maker both looks better than the competition, costs somewhat more, and is that bit more 'serious' - as befits a product from the UK's slaphead food scientist in chief. Rather than being a time-saving toy, we can glean that this machine is a tool for the keen baker who wants to perfect their own artisan loaves. So there's a manual override of the automatic preset baking cycles, and instead of a recipe book, you're given blank spaces in the instruction manual to fill in your own 'custom recipe charts'. We found said manual heavy going, but if you read it cover to cover, you'll come away with some understanding of the art of bread making, which isn't something you can say about the Russell Hobbs. Unfortunately, our attempts at actual bread making with it were a disaster. Given the price, it's hard to recommend a machine with so few features – there's no separate yeast dispenser and no bundled accessories for example. We'll leave this bit of kit to the professionals. No, it's not as good as the Panasonic SD-ZB2512, but this is cheaper, and another really tech-fuelled machine that delivers high quality loafage. 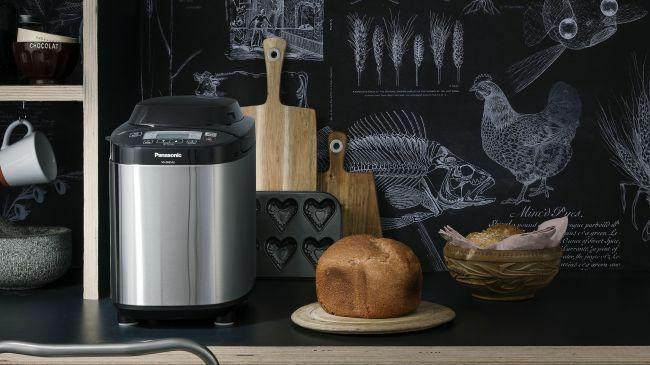 A tray ensures the yeast is not entered into the cooking process before it's suitably ready - another dispenser adds fruit and seeds - and Panasonic's gently maturing bread maker is also capable of churning out three sizes of loaf, as well as jam. Again, there's a 100% gluten-free setting and the Speciality Mode helps you experiment with a variety of interesting grains. Lovely. Despite being massive, this machine has one of the smallest baking pans, so your loaf is limited to 900g. Features are also thin on the ground, with no nut dispenser and only 13 preset modes. Morphy Richards describes the design as ergonomic, but that up-facing display is tiny and the massive lid just makes it feel top heavy. Frankly, it's an absurd amount of plastic for such a device, while the noisy kneading paddle suggests an underpowered motor that'll ensure this thing winds up in a landfill site before long. It took a few frustrating minutes to work out how to change the settings due to some glitchy electrics, and the loaf it eventually turned out was mediocre. Okay, this bread maker works, but it's a disappointment and definitely feels like a false economy compared to Russell Hobbs' similarly budget alternative. Fancy a coffee with that loaf?… Or what about some freshly squeezed juice?